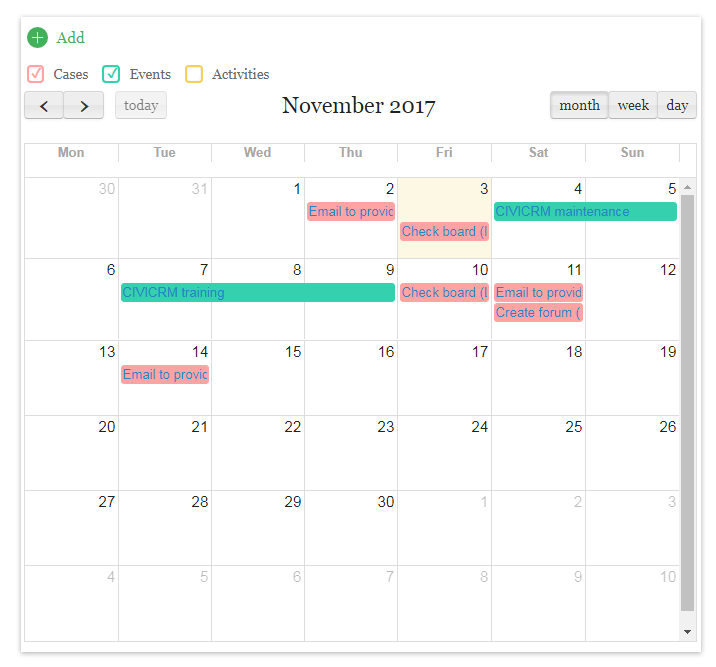 CiviCalendar is styled to resemble Microsoft Outlook Calendar. 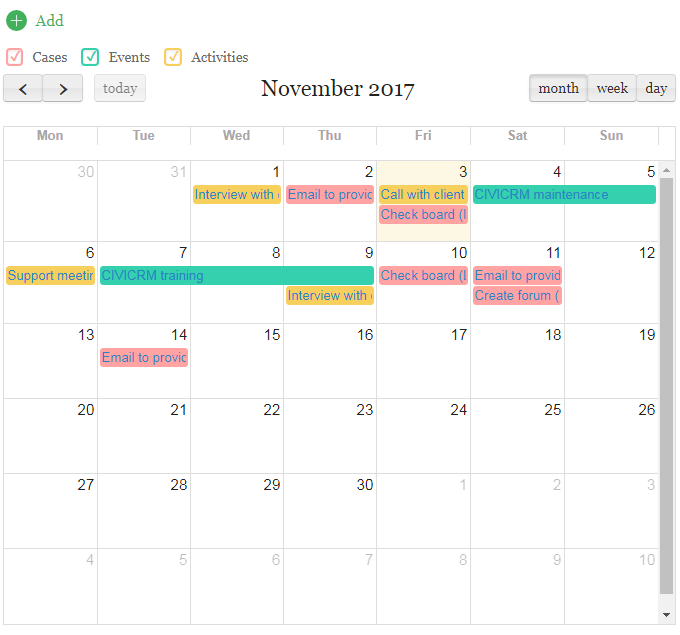 For visual distinction the list view is replaced with graphic calendar squares, while entries are shown in different colors. 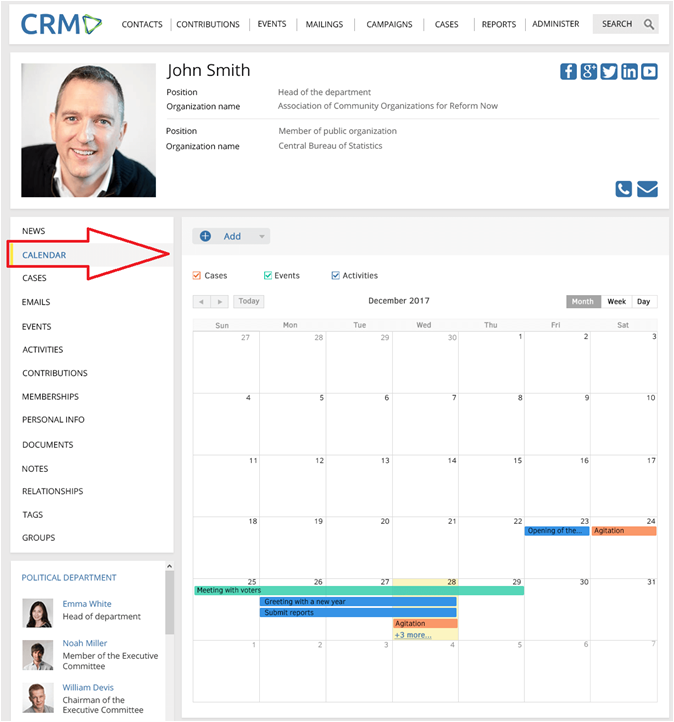 User-friendly interface and intuitive navigation make it a breeze for users to add items to the CRM calendar or view tasks assigned by executives. The latter can access officers’ schedule, make adjustments and appoint to a task. Upon one click all details of an assigned task or upcoming event appear on screen. It is essential that CiviCalendar supports Multilanguage and allows tracking records against Activities, Cases and Event. The checkboxes in the Calendar match the color of record types (Case, Event or Activity) and allow hiding or displaying them in the Calendar. Additionally, the calendar offers its users convenient navigation and an ability to switch between three types of view modes: month, week, and day. And even more prominent does CiviCalendar look together with the new UI, developed by Agiliway, as shown in pict. 4. To setup the extension simply download CiviCalendar extension, unzip the archive into the folder sites/default/files/civicrm/ext/ and activate it within the CiviCRM Extensions tab of the administration panel. There is also a plan in the works to level up the view tab of the Calendar so that two or more calendars were opened in the same window - e.g. the branch manager will see calendars of his subsidiaries. With CiviCalendar extension CiviCRM is definitely the place where the day of each organization officer will begin. The place where everything is lined up and well-organized is worth living much of your professional life in. We would appreciate if you tried new CiviCalendar extension and shared your feedback and suggestions for further improvements by email civicrm@agiliway.com. Nice. We were just doing more work with Drupal Views Calendar so timely reading of this. Can you clarify in the blog, does this Extension offer solutions for showing eg Activities that are not just related to the person, eg can it show a Calendar of all Case Activities, not just those associated with the person who is viewing CiviCRM? The Calendar is a tab on Contact. It allows watching activities/events associated with the selected contact. I.e. when you select any contact and go to Calendar tab then you will see the calendar for the selected contact, not your personal calendar. In order to watch your personal calendar, you will need to go to your contact record. On your Personal calendar, you will be able to choose up to 5 other contacts whose calendars you would like to watch (assuming you have access to those contacts). Then events/activities of watched contacts will be shown on your calendar. - This is done for managers to be able tracking/planning activities for their branch members. For contact type Organization the Calendar will show activities/events of all employees of this organization. We use Relationship for this. – This is also a feature for managers to track what is going inside their organizations. Will this new functionality address your needs? Now, when going to Calendar tab the Supervisor will be able watching info of all managers of the organization at the calendar. 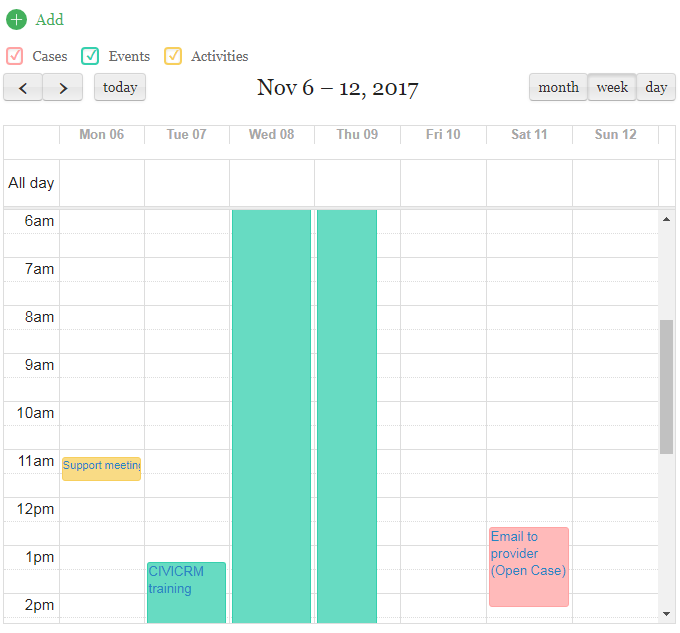 Is it possible to integrate entries in a Google Calendar with this CiviCRM Calendar? We never integrated Google Calendar with CiviCRM before. However, Google provides API to work with Google Calendar. So it should be possible integrating with Google using this API. We did similar integration projects to integrate RoundCube email client with CiviCRM and to integrate Facebook with CiviCRM. Where can we see and maybe download the new UI, developed by Agiliway, as shown in pict. 4? This Bootstrap-based UI was initially implemented as a custom solution for one of our clients. It is in the use now by the client. Also two months ago we agreed with CiviCRM core team to incorporate this Bootstrap UI into CiviCRM, not yet removing existing one. So a user will have two options: use current UI or new Bootstrap-based UI. The work is on early stage - we are finishing adopting Contacts now, then will be planning next sections with CiviCRM team. Anyway, I will be glad to show you how this works for our client. So you can decide if it fits your needs. Just write me when it is a suitable time for you - see my email in the above post. Where to discuss and ask questions?